By the Painter of the Centauromachia in the Louvre. Height: 40.3 cm. Diameter: 39 cm. Saint Petersburg, The State Hermitage MuseumInv. No. B. 1603 (St. 1590, B. 802). Height: 40.3 cm. Diameter: 39 cm. Inv. No. B. 1603 (St. 1590, B. 802). Unknown; from the Campana collection acquired in 1862. “So let them prepare for me the ground for a leap which will bear me far from hence; agile is the spring in my knees” (Pindar, Nemean Ode V). An athlete is preparing to jump from a standing start, with weights in his hands. He is receiving instructions from his paidotribe or perhaps the latter is telling him something. The athlete steps forward to steady his balance and to make the preparatory swaying movements. The position — he is leaning too far back — and the way he holds the weights are incorrect. The paidotribe is wearing a long mantle and holding a staff in his left hand. To the right of the central figures there appears a bearded man and to the left an athlete. 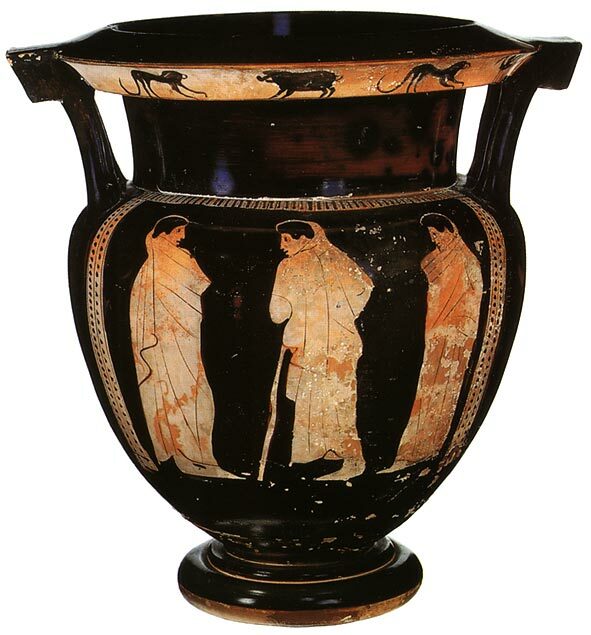 Side B represents a classic scene: an ephebe wearing a himation conversing with two other ephebes on either side of him. J. D. Beazley, ARV2 (Oxford, 1963) no. 21 p. 1089. A. A. Peredolskaya, Krasnofigurnye Atticheskie vazy (Leningrad, 1967), no. 198 p. 174, pl. CXXXIII, 2, 3. © 1993. Photo, text: Olympism in antiquity. Olympic Museum Lausanne. Bertelsmann UFA. Industria Gráfica S. A. Barcelona, 1993, p. 94 cat. no. 37.